"Jurassic World" holds top spot at box office, beats "Inside Out"
In a box-office bout of Tyrannosaurus-sized proportions, "Jurassic World" kept the No. 1 spot with one of the biggest second weeks ever, while Pixar's "Inside Out" nearly matched it with a $91.1 million debut well above expectations. Universal's "Jurassic World" took in $102 million in North American theaters, according to studio estimates Sunday, making it only the second release to break $100 million in its second week. The enormous holdover for "Jurassic World," which last week set an opening weekend record with $208.8 million, has been bested by only 2012's "The Avengers," which made $103.1 million in second week. The unexpected sensation of the Colin Trevorrow-directed, Steven Spielberg-produced fourth entry in the franchise had turned Disney's $175 million 3D "Inside Out" into an underdog expected to merely nip at the heels of "Jurassic World." But the emotional "Inside Out," about the voices in the head of an 11-year-old girl, blew past its own forecasts to set records, too. "Inside Out," which received stellar reviews, was the first Pixar release not to open in first place, following an unparalleled two-decade streak of 14 straight No. 1s. But it's the largest opening for a wholly original movie (one not based on source material or a sequel), unseating "Avatar" in that distinction. Directed by Pete Docter ("Up") and co-directed by Ronaldo del Carmen, "Inside Out" had been expected to open in the range of previous Pixar non-sequels like "Wall-E" ($63.8 million opening) and "Brave" ($66.3 million). But "Inside Out" was propelled by gushing reviews from critics, a flashy premiere at the Cannes Film Festival and an appetite for a movie from Pixar. The animation studio hadn't had a release in two years after delaying "The Good Dinosaur" last year. "We came into the weekend thinking we'd do something in the 60s," said Dave Hollis, distribution head for Disney. "As we got closer to release, we hit a critical mass of really unbelievable critical response. In this day and age where technology allows people to see a Rotten Tomatoes score or read something and pass it along to their friends, all of a sudden, there was quite a stir about this as a thing to see." The twin hits of "Inside Out" and "Jurassic World" are giving Hollywood's summer a major boost. The weekend was up a staggering 64.6 percent over the same weekend last year, according to box-office data firm Rentrak. In 10 days, "Jurassic World" has already made $981.3 million and appears poised to be among the highest-grossing releases of all time. "Part of the success of 'Inside Out' is owed to this massive infusion of moviegoers into the marketplace," says Paul Dergarabedian, senior media analyst for Rentrak. "If you look at last weekend, around the world, how many people were in theaters when 'Jurassic World' made its debut?" He added, though, that "Inside Out" was also driven by Pixar's unique storytelling knack: "They can take almost any subject and turn it into something insightful, poignant and moving." "Inside Out" and "Jurassic World" had the multiplexes largely to themselves over the weekend. The other wide release to open was "Dope," a low-budget teen comedy set in Los Angeles' Inglewood neighborhood. Written and directed by Rick Famuyiwa, starring newcomer Shameik Moore and boasting some high-profile producers (Forest Whitaker, Pharrell Williams), "Dope" was acquired by Open Road after a buzzy premiere at the Sundance Film Festival. Though Open Road gave "Dope" an optimistic wide release of 2,002 theaters, it took in only $6 million. In limited release, the Adam Scott and Jason Schwartzman comedy "The Overnight" - also a Sundance premiere - opened on three screens in New York and Los Angeles, pulling in $61,523, good enough for the most packed theaters (albeit in far tinier numbers) besides those playing "Jurassic World" and "Inside Out." Estimated ticket sales for Friday through Sunday at U.S. and Canadian theaters, according to Rentrak. Where available, the latest international numbers for Friday through Sunday are also included. Final domestic figures will be released Monday. 1. 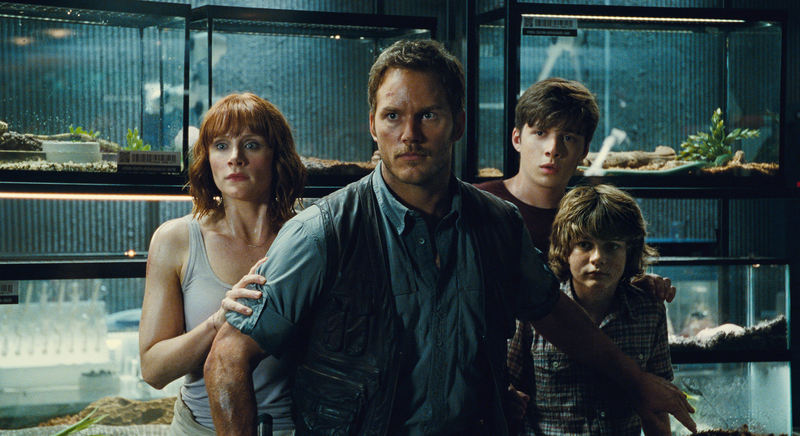 "Jurassic World," $102 million ($160.5 million international). 2. "Inside Out," $91.1 million ($41 million international). 3. "Spy," $10.5 million ($9.6 million international). 4. "San Andreas," $8.2 million ($18 million international). 6. "Insidious Chapter 3," $4.1 million ($3 million international). 7. "Pitch Perfect 2," $3.3 million ($1 million international). 8. "Mad Max: Fury Road," $2.8 million ($4.9 million international). 9. "Avengers: Age of Ultron," $2.7 million. © 2015 CBS Interactive Inc. All Rights Reserved. This material may not be published, broadcast, rewritten, or redistributed. The Associated Press contributed to this report.